Two areas of research have been coming together. The first is my biography of Dr Winifred Lamb, Honorary Keeper at the Fitzwilliam Museum, Cambridge. The second is a study on the development of guidebooks in England and Wales. These two areas merge as a young Ralegh Radford was taken round north-western Greece in the hunt for a suitable prehistoric site to excavate. They both joined William Heurtley’s excavation at Saratse in Macedonia. Radford also assisted (Sir) Charles Reed Peers with the publications of the excavations at Whitby Abbey. In 1929 Radford was appointed Inspector of Ancient Monuments for Wales and Monmouthsire. His first guide was for Grosmont Castle (1930) (and now part of Jeremy K. Knight’s very useful CADW guide to The Three Castles: Grosmont Castle, Skenfrith Castle, White Castle ). Radford then worked with Wilfrid James Hemp on the guidebook for Denbigh Castle (1932) in North Wales. Hemp had been appointed Inspector of Ancient Monuments for Wales in the Ministry of Public Works and Secretary to the Board of Ancient Monuments in 1913 (Dictionary of Welsh Biography). He had become Secretary to the Royal Commission on Ancient and Historical Monuments in Wales and Monmouthshire in 1928. Radford then prepared the guide for Goodrich Castle (1933), just over the border into England. He was then responsible for a series of guides in Wales: Ogmore Castle (1933), White Castle (1934), Dolwyddelan Castle (1934) and Kidwelly Castle (1935) [see shortened version]; Cymmer (Cymer) Abbey (1934), St David’s Bishop’s Palace (1934) and Strata Florida (1936). He also prepared the National Trust guidebook for the Roman Site at Segontium (1936). His work in Wales was interrupted with guidebooks for three castles in south-west England, all appearing in 1935: Tintagel Castle (1935), Restormel Castle (1935), and Lydford Castle (1935). In 1936 he was appointed Director of the British School at Rome. 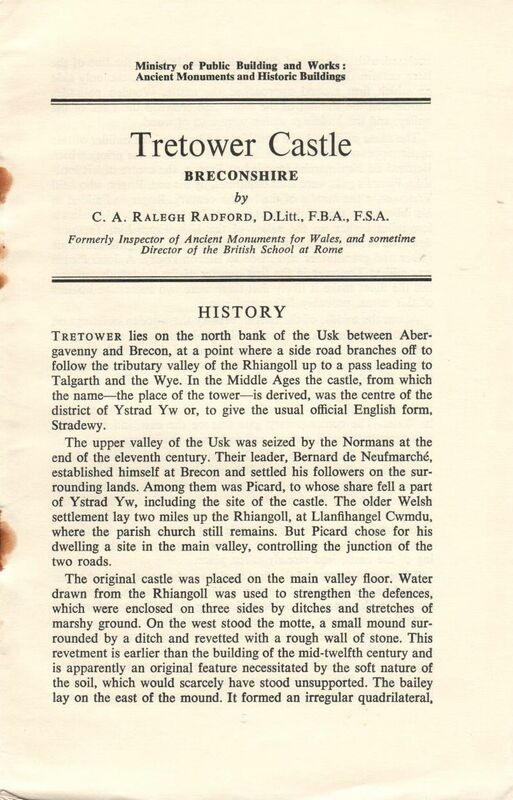 Radford prepared one further guide in Wales: Tretower Court (1938). This list of over 30 guidebooks and leaflets to many of the key medieval castles and monastic sites in England, Wales, and Scotland is but a tip of Radford’s contribution to the interpretation of British built heritage. Perhaps of note are his studies on inscribed stones: Margam (1949), Pillar of Eliseg (1953), Kirkmadrine (1953), and The Sandbach Crosses (1956).